India’s largest crowdfunding site. Over Rs.547.66 Crores raised. Let's Help Vijay Walk Again! Vijay is a 20-year-old who lives near our children’s home (orphanage) in Bogadi, Mysore. He lives in a very low-income area with his father. Vijay’s father has no education and earns money collecting plastic and paper. Mother died several years ago. Although a youthful 20 years old, Vijay can’t walk. After his mother died, Vijay went to live with his grandmother in Tamil Nadu, where life was not so happy. We are told that, six months ago, Vijay’s grandmother said something to Vijay and Vijay then poured kerosene on himself, setting his legs on fire in an attempt to commit suicide. He survived, but since then has not been able to walk. Vijay’s dad, Devendra, brought Vijay back to Mysore about a month ago to take care of him. Life is difficult for Vijay and dad because Vijay needs help with everything. Mostly, he sits or lies down at home all day when dad has to go out to earn money. At least Vijay’s aunty lives a few doors down and helps them with meals. We took Vijay to our doctor friend nearby, who said that he has “frozen knees” and his leg muscles have atrophied from lack of use. 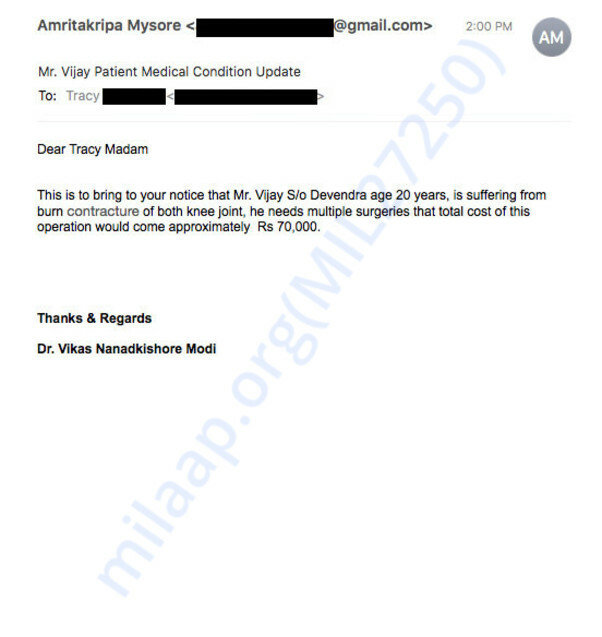 The plastic surgeon said that Vijay needs two operations to get his legs moving again, and then he’ll need months of physical therapy. Vijay wants to walk again and he and dad are ready to do the hard work, so we are asking for your support to help Vijay walk again. Let’s get Vijay walking again! Thank you for the wonderful support that you have shown towards Vijay. He had his second surgery a week ago, and just got discharged. He's doing quite well and is happy to have two working legs again! Here is an update on Vijay's health. Vijay had his first surgery, on his right leg, and is doing well! He was discharged from the hospital and smiled for the first time -- he's genuinely happy to be halfway there to walking again!!! His second surgery is to be scheduled, and Vijay goes back for checkups and dressing changes every few days. Let's support Vijay so he can walk again. Donate what you can to help pay for the surgery on his left leg.